"A frozen pie using pumpkin and vanilla ice cream." To prepare crust, combine crumbs, sugar and margarine in a mixing bowl. Press mixture firmly into prepared pan. Chill 1 hour or until firm. Or bake in a 375 degree F (190 degrees C) oven for 10 minutes or until edges are brown. Cool on rack before filling. To prepare filling, combine ice cream, pumpkin, brown sugar, ginger, cinnamon, nutmeg, and orange juice, and pour into crust. Freeze until ready to serve. This recipe was good, but made too much. Few people chose this desert at Thanksgiving. I make this pie now every holiday season. It is the best twist on a standard pumpkin pie that I've ever found. Everyone I know LOVES this pie; and it's so easy too! 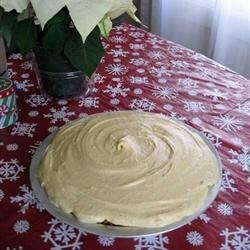 I tried this with a commercially made shortbread cookie-type crust, and it was really good! Quick and easy to make, but must allow time to freeze it before serving. This is a different wonderful pumpkin pie to serve. I made this years ago but instead of the graham cracker crust I lined the pie pan with gingersnaps. Try it you will like it. Great new add for Thanksgiving dinner - love the frostiness of the ice cream with the pumpkin pie flavors! Delicious! I served it half thawed and it was amazing. I use the crust recipe for other pies now.